Let's start with a poem. 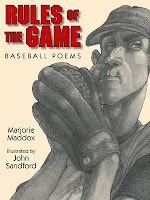 Rules of the Game, written by Marjorie Maddox and illustrated by John Sandford, is a collection that is not only a technical examination of the rules of the game and jargon, but also one filled with an intense love for the game. How can you not love a book with a poem devoted to the infield fly rule? Here's the concluding poem from the book. Poem ©Marjorie Maddox. All rights reserved. Let me admit here and now that I'm in love with Kevin Boland (known to his baseball-playing buddies as Shakespeare). How could I not love a boy who loves two of my favorite things--baseball and poetry? How could I not appreciate a boy who writes things like this? Shakespeare Bats Cleanup, written by Ron Koertge, is an emotional story told through poems laced with humor, angst, love, loss and of course, baseball. What's a boy to do when he's told he's sick and can't play the sport he loves? His father, who is a writer, hands him a marble composition notebook and and says, "You're gonna have a lot of time on your/hands. Maybe you'll feel like writing/something down." The sequel to Shakespeare Bats Cleanup is the book Shakespeare Makes the Playoffs. Kevin Boland struggles with his new girlfriend (who doesn't really know much about poetry), his new poetry gal pal (who totally gets his poetry obsession), his English class, his father's dating, the line between friendship and something more, and baseball. As with Shakespeare Bats Cleanup, I appreciate Kevin's take on writing, life and baseball. Here are a few of my favorite excerpts. 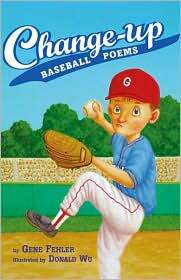 Change-Up: Baseball Poems, written by Gene Fehler and illustrated by Donald Wu, is a collection of thirty-six poems in which the narrator describes his baseball-loving life. The collection begins in February with "Snow Baseball" and ends one year later with "Ballfield in February." In between there is anticipation, celebration, and a true reverence for the game. The fact that the narrator is a young boy who shares his love of the game with his family adds to the kid-appeal of this one. Here is one of my favorite poems. Poem ©Gene Fehler. All rights reserved. If you are interested in connecting this book to writing, you can download an activity sheet that encourages kids to write their own book of sports poetry. 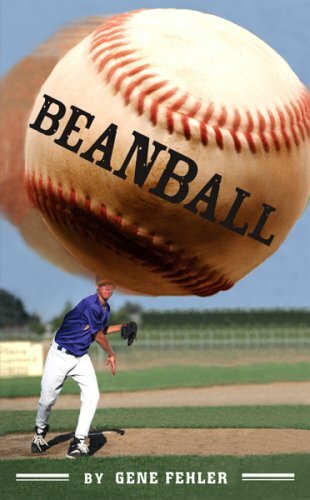 Fehler has also written a free verse novel entitled Beanball. Here's an excerpt from the poem that describes the defining event of the novel. in all my years of umping. Oh, I’ve heard plenty of pitches hit a helmet. But this . . . this fastball, up and in. This one hit bone, right in the face. Not even a scream or grunt from the kid. He went down like he was shot. maybe a dozen of his games. The kid’s a great athlete, a natural. That’s why it was such a shock to see him go down like that. Luke "Wizard" Wallace's story is told by 28 different narrators. They include members of his Oak Grove baseball team, members of the Compton baseball team (the team Oak Grove was playing when Luke was hit), a number of Oak Grove High School students and teachers, members of Luke's family, a doctor and nurse at the hospital, and a number of other characters. There are many voices to keep track of at first, but they intertwine rather seamlessly to tell a most compelling story. That's it for today. See you tomorrow with another mystery post! WORD, on the sestina, man. STILL makes me want to weep. Copiously. I LOVE that Ron Koertge.